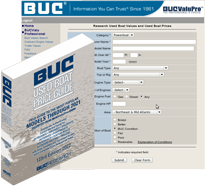 BUCValu Professional is a subscription-based service for marine industry professionals who require comprehensive, detailed boat evaluations. BUCValu Professional provides the most accurate, statistically authenticated current market values available. The values are updated continuously as we receive new pricing information. BUCValu Professional adjusts pricing based on the location and condition of the boat and displays all possible matches for each query. The sophistication and accuracy of the BUCValu Professional service is unrivalled, and it is an indispensable tool for surveyors, brokers, financial institutions and insurance companies. Click here to find out more or purchase a membership.